The fuel air mixture debate centers on whether to operate an engine on the rich side or on the lean side of the peak exhaust-gas temperature. A discussion of how the fuel air mixture impacts the performance of the aircraft’s engine. In previous articles, I have explored some of the physics that makes tailwheel-configured aircraft challenging, and my experiences as a student pilot as I worked to overcome those challenges. Thus Disciples of Flight is, for me, like the scientific journals I write for as part of my day job: a place to summarize what I’ve learned in order to share it with others. At the same time, the act of distilling information into a digestible form is a learning process in itself. In addition to demanding that I master the techniques of controlling a taildragger, purchase of a Cessna 185 has also required me to learn a little about the management of a high-performance general aviation engine, the Continental IO-550. Proper engine management can extend the lifetime of such expensive-to-overhaul beasts, as well as effect the daily expense of fuel consumption. 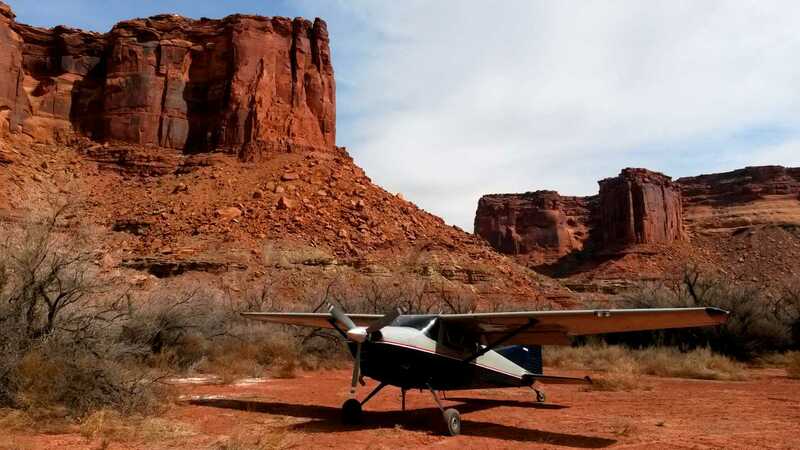 The Author’s Cessna 185 at Mineral Canyon Airstrip, Southern Utah. Here, I will begin to explore the issue of the fuel air mixture, and how this mixture impacts the performance of the engines we fly. I’ll start by reviewing some chemistry, then describe measurements I made with my own aircraft regarding the impact of the fuel air mixture on engine temperatures, airspeed, and fuel economy. Note that I am neither an engineer nor an aircraft mechanic. While I hope that this article will motivate others to understand their engines better, I strongly advise anyone considering doing such experimentation to consult with a true engine expert before doing so. Modern human civilization is powered by the combustion of hydrocarbons. Hydrocarbons are molecules which consist of hydrogen and carbon atoms. They are the active ingredient in fossil fuels, which we go to great lengths to extract from the Earth. Combustion is the rapid chemical combination of a material with oxygen. In the case of hydrocarbons, the product of this combustion include carbon dioxide, water, and energy in the form of heat. The fuel which powers most piston-engine general aviation aircraft goes by the name “100LL” or “avgas”. The 100 is the octane rating of the avgas, on the same scale as the octane ratings (typically in the 80’s and 90’s) of the “mogas” that you put in your car. LL stands for “Low-Lead”, meaning that unlike mogas, a small amount of tetraethyl lead has been added to improve performance. What does the octane rating mean? An engine consists of several chambers or “cylinders”, into each of which is injected a mixture of air and avgas. This mixture is caused to undergo combustion at the proper time by a spark, generated by the spark plugs. The properly timed explosion of the fuel air mixture in the cylinder drives a piston, which is in turn connected to a crankshaft, which spins the propeller. A problem arises because, in some cases, the pressure and heat inside the cylinder can cause fuel to undergo combustion at the wrong time. This process is often called detonation, and it can cause stress on and ultimately damage an engine. Studies have shown that a fuel consisting solely of a hydrocarbon known as iso-octane (2,2,4-Trimethylpentane) is fairly detonation-resistant. On the other hand, a fuel consisting of pure heptane (another hydrocarbon) is subject to a high amount of detonation. A particular fuel’s octane rating is simply the percentage of iso-octane in an iso-octane and heptane mix, which would give the same level of detonation as the fuel being rated. Top: The heptane molecule, C7 H16, consisting of seven carbon atoms (black spheres) and sixteen hydrogen atoms (white spheres). Bottom: The iso-octane (or 2,2,4-Trimethylpentane) molecule C8H18, consisting of eight carbon atoms and eighteen hydrogen atoms. 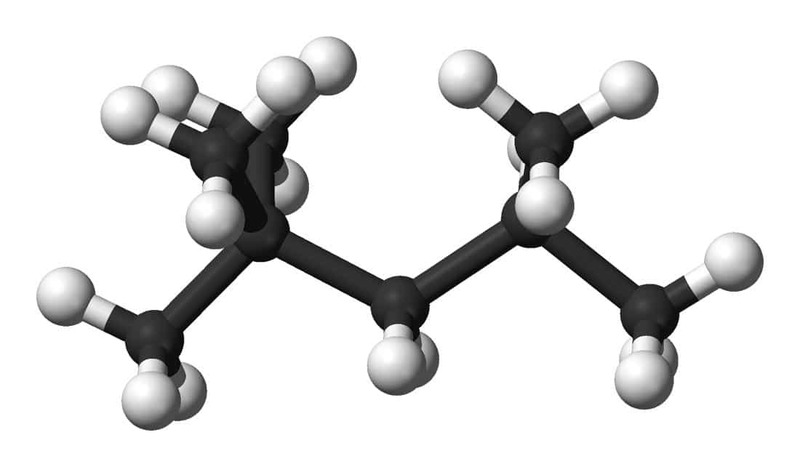 100LL Avgas is a mixture of several iso-octanes (hydrocarbon molecules containing eight carbon atoms) and tetraethyl lead, which gives a detonation level similar to 100% 2,2,4-Trimethylpentane. We can use this information to get a rough idea of the fuel air mixture which will result in the optimal level of combustion. In plain English, two molecules of iso-octane will combine with 25 molecules of oxygen (oxygen is found in nature as a molecule consisting of a pair of atoms, hence the subscript 2) to form 16 molecules of carbon dioxide (CO2) and 18 molecules of water (H2O). Check for yourself that there are the same amounts of each type of atom on either side of this reaction! From here, it’s straightforward (for anyone who has taken some basic chemistry) to calculate the fuel air mixture for complete combustion. Suppose I have a cubic centimeter (abbreviated “cc”; about 1/15th of a tablespoon) of liquid avgas. How much air would be required for complete combustion? Well, the density of liquid avgas is about 0.7 grams per cubic centimeter. (You may be more familiar with this expressed as 6 pounds per gallon.) The molar mass of octane is 114.23 grams, so one cc of avgas is 0.00613 moles of avgas. This must mix with (25/2) × 0.00613 = 0.0733 moles of O2. At 25 Celsius, the volume of an ideal gas at sea-level air pressure is about 24,500 cc/mole. So the volume of 0.0733 moles of O2 will be about 1,874 cc. Air is only 21% oxygen by volume, so it will take 8,924 cc or about 9 liters of air to burn 1 cc of avgas. What happens if the fuel air mixture at combustion is less than 1 cc per 9 liters? This is what we call a “lean” mixture, and it will produce less heat than the optimal mix. If the mixture is greater than 1 cc per 9 liters, it is what we call “rich”. In this case, all of the fuel does not burn and we are left with less heat per unit of fuel consumed. Also, in the too-rich case, leftover hydrocarbons can remain. These leftover hydrocarbons can, in some cases, form crud with the potential to foul the engine. Before purchasing a high-performance airplane, I had heard from instructors and read in magazines of an ongoing debate about optimal engine operation. The debate centered on where to operate an engine in the continuum of lean to optimal to rich mixture settings. Typical of the debate was the “Dogfight” column in the May 2011 AOPA Pilot. In practice, the precise fuel air mixture is difficult to measure directly. Fuel flow, in units of gallons per hour or pounds per hour is straightforward to measure, but the amount of air in the mix will depend on things like altitude and air temperature, which will vary over the course of a flight. So the fuel-air mixture is typically probed indirectly, by looking at the exhaust-gas temperature. Roughly, the peak exhaust-gas temperature will occur at the optimal fuel-air mix. I say roughly, because — perhaps surprisingly — fuel can play a role in cooling an engine. The fuel-air mix debate centers on the question of whether to operate an engine on the rich side of the peak exhaust-gas temperature or on the lean side of the peak exhaust-gas temperature. Why not run at the peak? For some power settings the heat generated in peak combustion is simply too hot for the engines to handle. Extended operation at these settings can damage the engine. 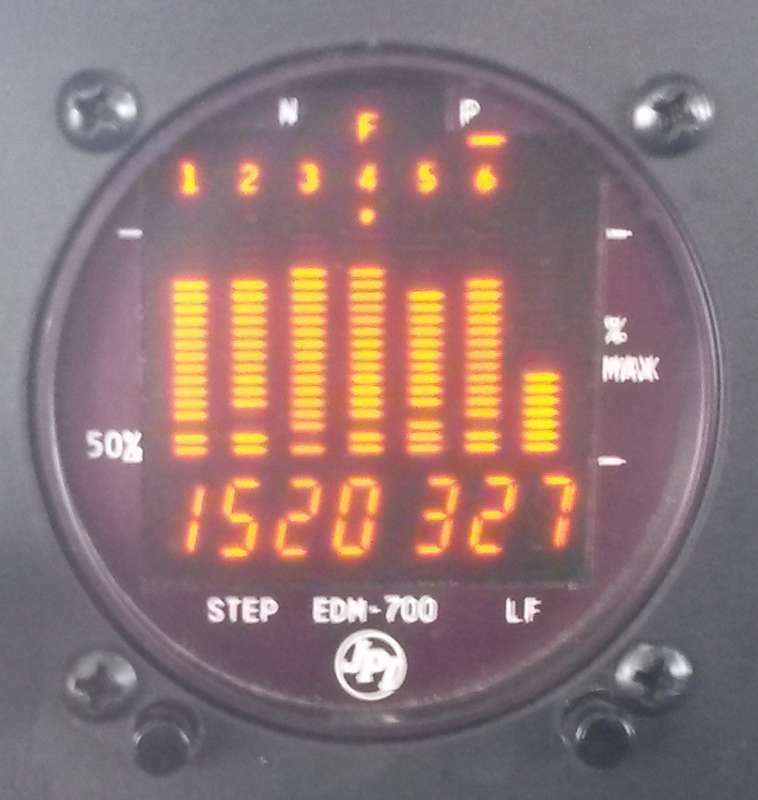 The J. P. Instruments EDM 700, displaying exhaust gas temperature (EGT) and cylinder head temperature (CHT) for cylinder number four. To study the effect of fuel air mixture on my IO-550, I made use of the J.P. Instruments EDM-700 engine data monitor which is mounted on my instrument panel. This, or a similar device, would be necessary for anyone wishing to perform such tests on an engine. The EDM is connected to probes which measure exhaust-gas temperature (EGT) as well as cylinder-head temperature (CHT) for each cylinder. The CHT probe is a direct measurement of the temperature of the engine cylinder itself. Ultimately, CHT is the factor which most effects the lifetime of an engine. The IO-550 Operations Manual recommends that the CHT never exceed 460 degrees Farenheit. Mechanics recommend 400 degrees or less while in cruise. It is also recommended that the CHT not be allowed to drop below 300 degrees Farenheit for more than five minutes, for example while descending. The EDM-700 also measures and calculates other useful quantities, like outside air temperature, fuel flow rate in gallons per hour, fuel remaining, and so on. Finally, I make use of my airspeed indicator in these tests, because I want to know how the fuel-air mix is going to effect the time it takes me to get from A to B. A simplifying assumption I’m going to make for the discussion below is that the average EGT and CHT are good stand-ins for the EGT and CHT of the individual cylinders. Note that unless the engine is equipped with a tuned injection system, this is generally not the case. I hope to follow up this article with a discussion of the multi-cylinder complications in the not-too-distant future. I performed the test by establishing a constant throttle, propeller speed, and altitude. An autopilot helps here, otherwise you might want to take along a buddy who can write down numbers for you. For the tests I describe below, I chose a manifold pressure of 23 inches of mercury and a propeller speed of 2,300 RPM. (This corresponds to about 60-65% of maximum power with an IO-550 D.) I flew at a pressure altitude of 6,500 feet, and the outside air temperature was 59 degrees Farenheit throughout these measurements. The quantity I controlled in these measurements is the fuel flow, in gallons per hour. I set the flow using the mixture knob, then read the gallons per hour off of the EDM. At each fuel flow setting, I waited a few minutes for the readings to stabilize and then recorded the EGT and CHT for each cylinder from the EDM, and also the indicated air speed (IAS) from the airspeed indicator. I started the tests at a fairly rich fuel flow of 18 gallons per hour (GPH) and gradually leaned the mix. I stopped when the engine began to misfire at about 12 GPH. Average Exhaust Gas Temperature (degrees Farenheit, vertical axis), versus fuel flow (gallons per hour, horizontal axis). 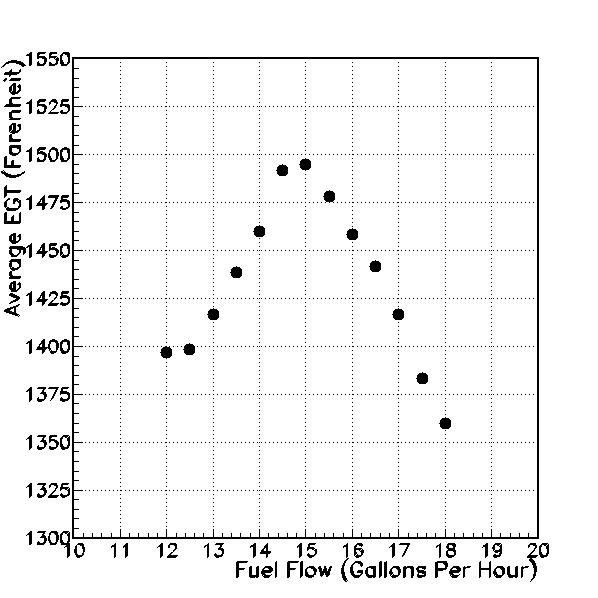 In the figure above, I have graphed the average EGT versus fuel flow. On this graph, leaner mixtures are to the left and richer mixtures are to the right. 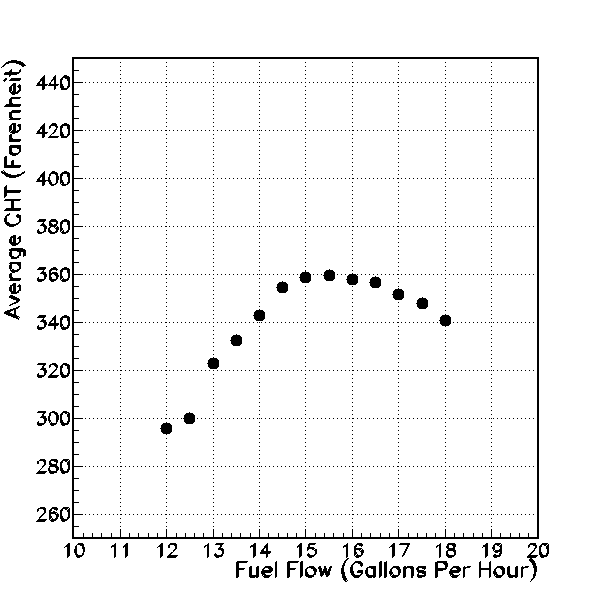 The graph shows a clear “peak” in the average EGT at a fuel flow of 15 gallons per hour (GPH). From a setting of 15 GPH, if I either increase or decrease the flow, the average EGT decreases. Now, at the same fuel flow settings, what happens to the average cylinder-head temperature? Average Cylinder Head Temperature (degrees Farenheit, vertical axis), versus fuel flow (gallons per hour, horizontal axis). I graph average cylinder head temperature or CHT in the figure above. First, note that the average CHT is always well below the recommended 400 Farenheit cruise temperature. The CHT drops more quickly on the lean-of-peak side of 15 GPH, than it does on the rich-of-peak side. The indication seems to be that we can obtain cooler CHT’s using the lean-of-peak mixture settings. In fact, at the lowest fuel flows of 12 and 12.5 GPH, the average CHT is close to the minimum recommended operating point of 300 degrees Farenheit. 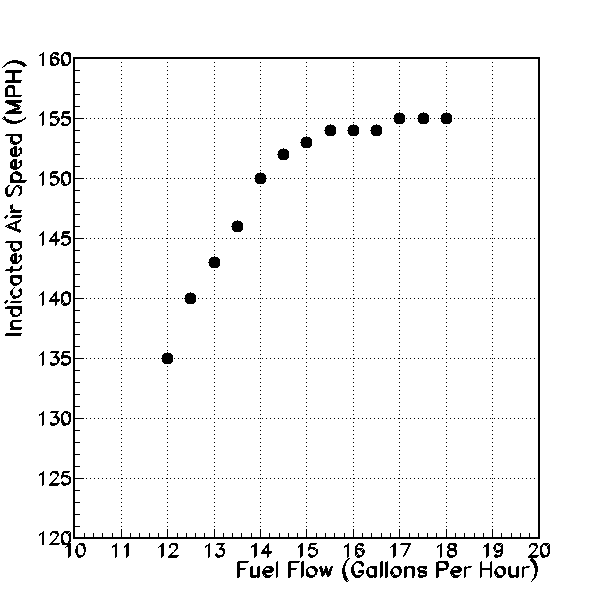 Indicated air speed (miles per hour, vertical axis), versus fuel flow (gallons per hour, horizontal axis). Next, I graph indicated air speed versus fuel flow. The trend is clear, that greater fuel flow produces greater air speed. Note that the air speed tends to “level off” at fuel flow above 14-15 gallons per hour. Adding more fuel beyond peak EGT does not cause a large increase in airspeed. But clearly if my goal is to get there as fast as possible, I want to choose the rich side of the peak exhaust gas temperature. 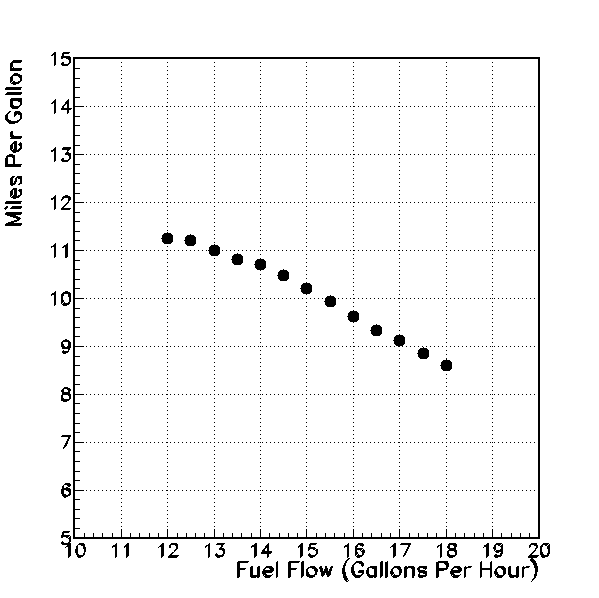 Air miles per gallon (vertical axis), versus fuel flow (gallons per hour, horizontal axis). Finally, to consider fuel economy, I graph the air miles per gallon versus the fuel flow. This is just the indicated air speed divided by the fuel flow, plotted against the fuel flow. And this reveals the interesting trend that mileage decreases as fuel flow increases. If my goal is to get there as efficiently as possible, I want to be on the lean side of the peak exhaust gas temperature. In fact, operating at the leanest settings requires only about 3/4 of the fuel as the richest settings, when covering the same distance. Avgas, and indeed all fuel, mixes with air in a particular ratio in the process of combustion. In this article, I have attempted to illustrate how varying the fuel-air mixture impacts the performance of the IO-550 engine in my Cessna 185, as an example of the principles involved. As stated above, in the results and discussion presented, I made the simplifying assumption that the average exhaust gas and cylinder head temperature is a reasonable stand-in for the consideration of the cylinders individually. This simplification enables us to understand the “big picture” of what may happen when fuel air mixture is varied. Under these assumptions, and for the particular set of flight conditions described, it seems as though the ideal operating point would be a fuel flow of approxiately 13 gallons per hour. At this flow rate, the average CHT is a cool 320 Farenheit, well above the minimium recommended operating temperature. The airspeed is about 143 MPH, perhaps 10-15 MPH slower than could be achieved with higher fuel flow. However, the overall mileage at 13 GPH of 11 miles per gallon is a 25% improvement over that of higher fuel flow rates. Further, with leaner fuel-air mix, there should be less potential for hydrocarbon buildup and engine fouling. In reality, any engine is in some sense a collection of little one-cylinder engines operating in parallel, but with a single control for fuel flow. The exhaust gas temperature curves may vary significantly from cylinder to cylinder due to differing fuel flows, and one cylinder may be lean-of-peak while another is on-peak or rich-of-peak. This may result in it being difficult or impossible to find an appropriate lean-of-peak setting. I hope to discuss technical solutions to this problem in a forthcoming article. John Belz grew up in Philadelphia and moved around the U.S.A. a bit before settling in Salt Lake City. Now he is a physics professor at the University of Utah, and in addition to teaching courses at the U, John does research in the field of particle astrophysics using an observatory in Utah's West Desert. John's interest in flying dates back to his teens. He joined the Air Force because he wanted "to fly jets", but his failure to maintain the necessary haircut delayed his pilot training for almost thirty years. Finally, on 9/9/9 he completed his checkride and became a certifiable pilot. John considers himself the luckiest man alive, with a great job, great hobbies, a wife and partner Kolaleh who keeps him laughing and a stepdaughter Niki who tolerates his eccentricities in exchange for flight time. He is looking forward to contributing his perspective as a scientist to the Disciples of Flight. Very nice graphic illustration of the change in performance by altering AFR. Not sure all readers enjoyed the chemistry, but it certainly took me back to those days of innocence! Great article!!! Glad to see you are flying and writing! !